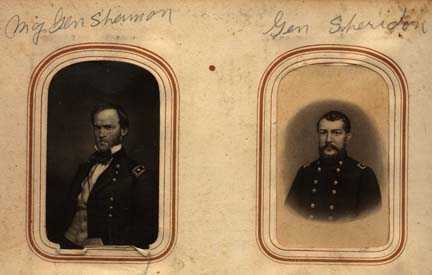 Photos of Generals Sherman and Sheridan appear in the McNeal family's Civil War era photo album. Every attempt has been made to preserve the writing eccentricities of these documents, although someone making a close comparison would notice minor differences such as omission of strikeovers. Spelling, the absence of periods and limited use of capitals make Allan McNeal's letters somewhat hard to read but I believe provide a better sense of him as a person than would be possible if these things were corrected. The documents have suffered some in 130 years but, though tattered, are whole and legible. Allan McNeal's handwriting is much easier to read than Wilson DeGarmo's, although Wilson's spelling and punctuation are much better. Numbers and capital letters posed some problems in interpretation and it is possible that an occasional proper name is incorrect. Most of the writing was in pen but a few diary entries and one letter were in pencil. The diary was unsigned so there for some time was confusion about its authorship. My family had assumed it was written by Henry McNeal, who is identified in the family photo album as "Cap." McNeal. But not only had he died before the diary was written, the "Cap." apparently should have been read as "Cop. ", an unorthodox abbreviation for corporal. That left Wilson as the only officer in the family the only possible author of the diary. The search continues for information about the Civil War McNeals and DeGarmo, and as it is found this site will be updated. The McColley family represents another branch of my family tree. Although I possess none of their letters, five of my great-great uncles in that family served in Wisconsin and Minnesota regiments during the war. Portions of letters from some of them are preserved in a family history, "Pioneer Heritage: A McColley Family History," published in 1993 by Dallas McColley (9240 330th Ave. Waseca, MN 56093-5010). The two letters and the photo believed to show my great-great-great grandparents Alexander and Polly McColley are reproduced on this Web site with his permission.